The Ghost Gum offers an impressive welcome to anyone who adventures beyond the Australian city. If there is one iconic symbol reassuring true-blue Aussies they have arrived home from their global travels, it is the Eucalyptus or Gum Tree. 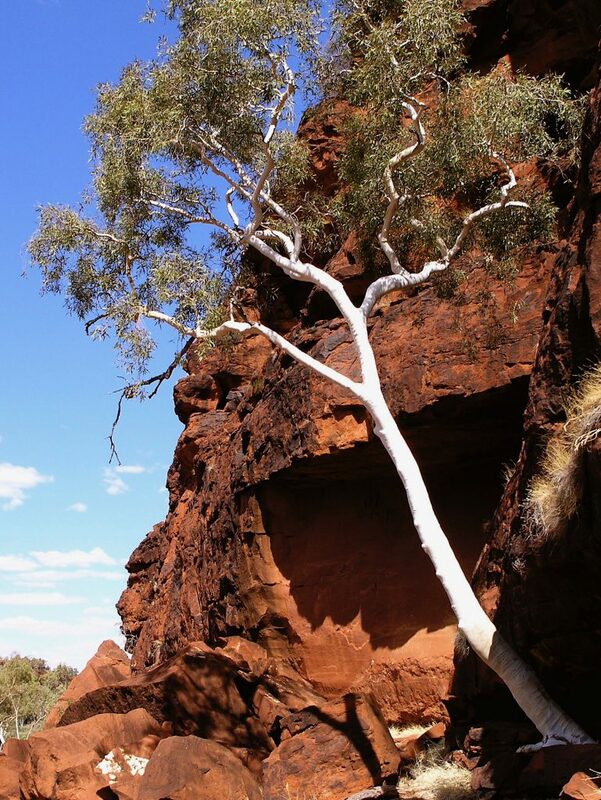 For residents and travellers of the arid heartlands, it is the Ghost Gum, ranging prominently across rocky slopes, red sand plains and arid creek flats. Standing gnarled and contorted from their struggle through periods of drought, their brilliant white bark, nature’s sunscreen reflecting the heat of the day, is a photographers magnet, a stand-alone presence against brilliant blue skies, the rich red cliffs of gorges and ranges snaking across the inland. But it is the bark of the tree glowing in a moonlit night which adds belief to the Ghost Gum name. 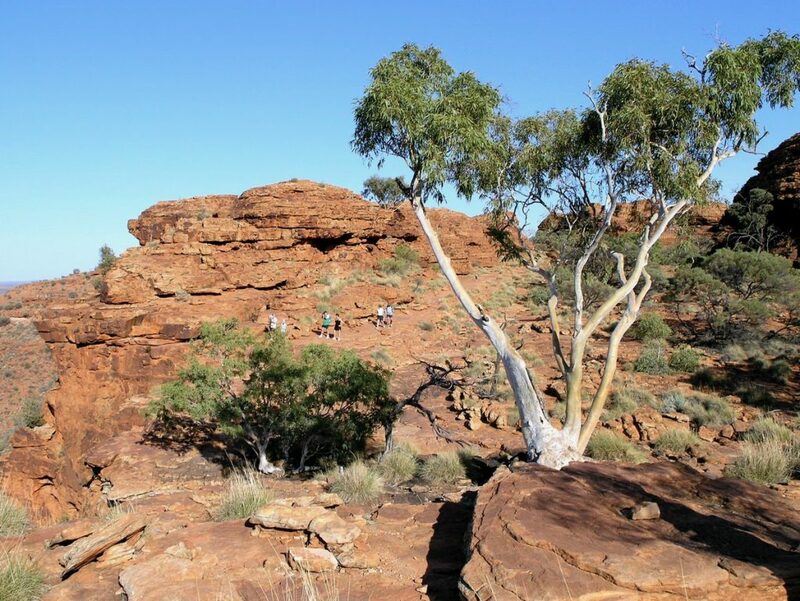 It is the tenacity to find a toe-hold and enduring life in the most inhospitable crevice of a rock face that captures our guests attention and delivers indelible memories on both our Red Centre and Corner Country Outback Tours. The Ghost Gum became a symbol of Australian spirit of political proportion in 1891. 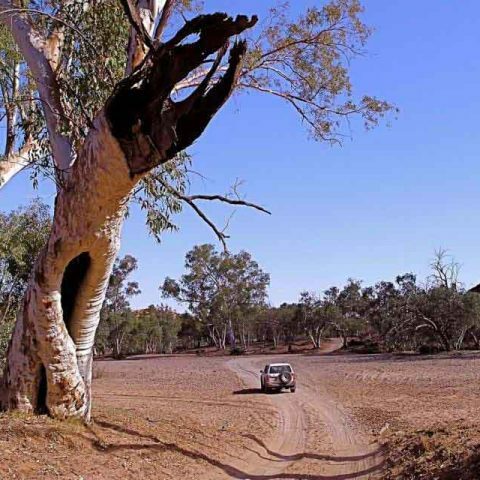 One ancient tree was the shaded meeting place of striking shearers in the main street of Barcaldine in Central Queensland, leading ultimately to the formation of the Australian labor Party. This “Tree of Knowledge” was eventually poisoned but its legend lives on in Barcaldine and the party. 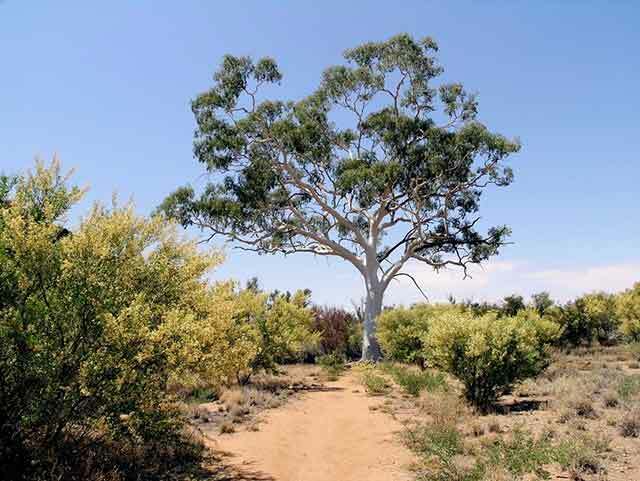 The Ghost Gum, of which there are 24 species and subspecies, enjoys a deep respect and connection with our First Peoples. In season, the bark turns a powdery white, the dust used to whiten tribal headbands for ceremonial occasions. Generations believed and were taught the glow of the trees at night was evidence of the presence of living spirits and at least one story from Aboriginal astronomy emerged in the dreamtime indicating the Southern Cross was a Ghost Gum with two Sulphur-crested Cockatoos trying to roost on its branches. Beyond the spiritual, the tree provided good firewood, even resistance to rain. Gum from the tree was used as a leech repellent and an antiseptic relief from burns. 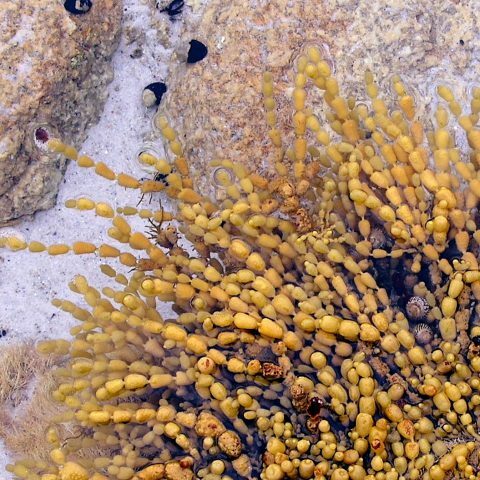 Properties and preparation from the bark were used to fight chest infections and sore eyes. It stands to reason the Ghost Gum holds a special place in the life of Aboriginal people, one being celebrated Australian Albert Namatjira. Albert Namatjira was a Western Arrernte artist in Central Australia who achieved international fame completing 2000 artworks, inspired by and mainly featuring majestic Ghost Gums set in the rugged geological landscape of his homeland. He pioneered contemporary Aboriginal Art centred around “portraits” of Ghost Gums all in pastel water colours. In his short life he was raised in Christianity at the Hermannsburg Lutheran Mission, tutored in art, before returning to the bush and traditional culture. He brought the beauty of Australia’s outback to the world, including Royalty and in 1956 his portrait won the national Archibald Prize, arguably Australia’s most celebrated art award. Sadly, in December 2012, two of the Ghost Gums featured prominently in his best known works and on an Australian postage stamp, on the eve of their being heritage listed were destroyed under suspicious circumstances by fire. Today, our tour guests happily snap images of Ghost Gums for their personal albums or that enduring impression of Australia in their home gallery. 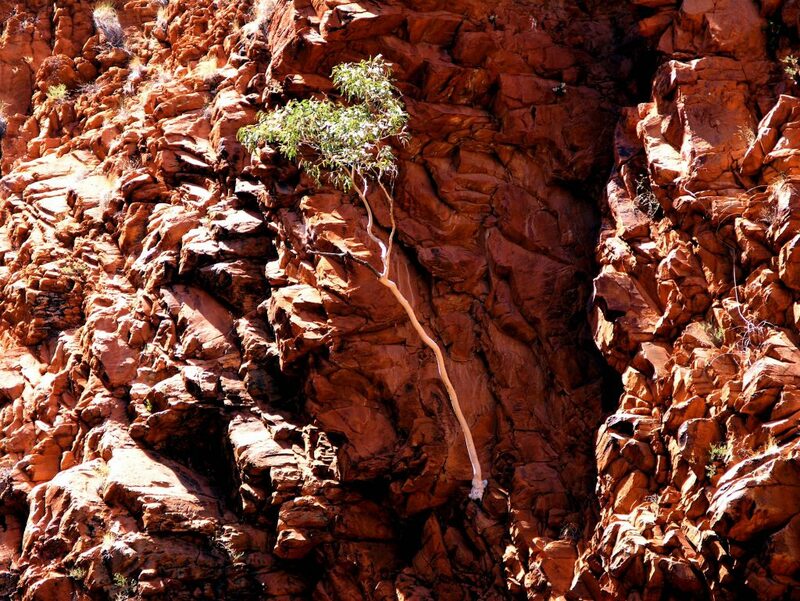 Feature trees are located near the entry to Trephina Gorge in the East Macdonnell Ranges, on the Rim Walk of Kings Canyon and hanging precariously off the cliff face of gorges or the red sand plains through the Channel Country. 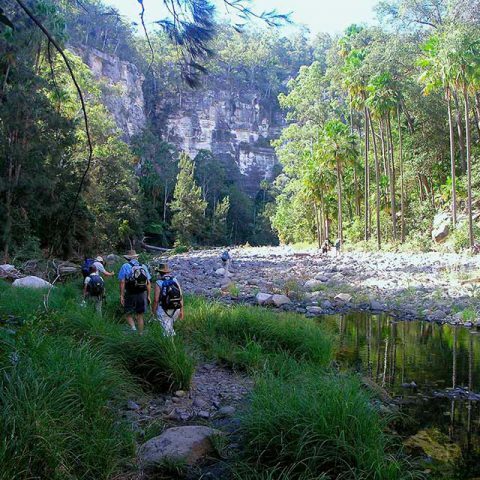 We are reminded of the connection that has existed between mankind and nature at the deepest spiritual and practical level over thousands of years while opening our minds to dreamtime wisdom, educational story telling and even Aboriginal Astronomy. If you have a classic image of a Ghost Gum, or a Ghost Gum story you would like to share with our blog readers then email it to us at Nature Bound Australia. It’s about time you visited Central Australia – But why?